Granada, the spanish capital close the desert Sierra Nevada, is not only famous for his Gothic and Renaissance architectur. Currently it is also often mentioned in the Iberian muscial news for his booty-shaking Dubstep scene. This month the Sub’ Vision crew invited Sam Simpson aka Baobinga, the man from Manchester that is famous for mixing a buggy blend of Dubstep, Breaks and Drum and Bass. His releases on labels like Soul Jazz Records made him one of the hottest new Dubstep headz from the north of Great Britain. 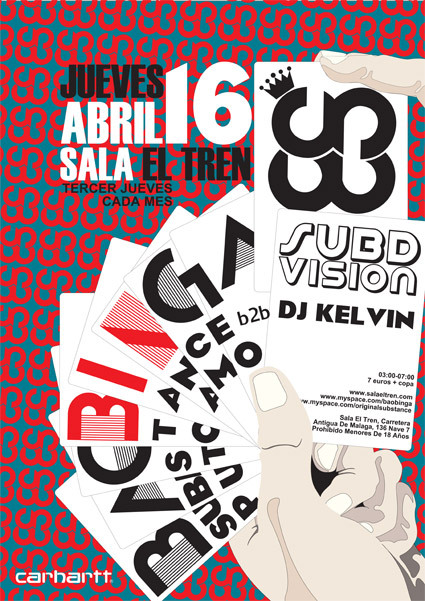 His first rhythmic assault in Granda will be backed by the Sub’ Vision resident DJ Kelvin and Puto Amo, who both guarantee that also HipHop and some sonic Electronic vibes enlarge this party into one super-sized wave of inescapable bass power.